TUALATIN — So close. So very close. Just one goal. Just a few more minutes, or even just a few inches lower. 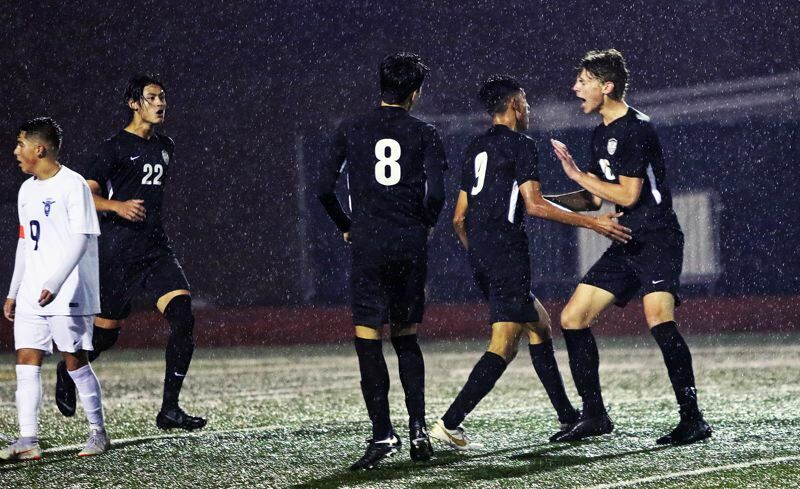 That's what possibly stood between the Tualatin High School boys soccer team and a Class 6A state playoff victory. 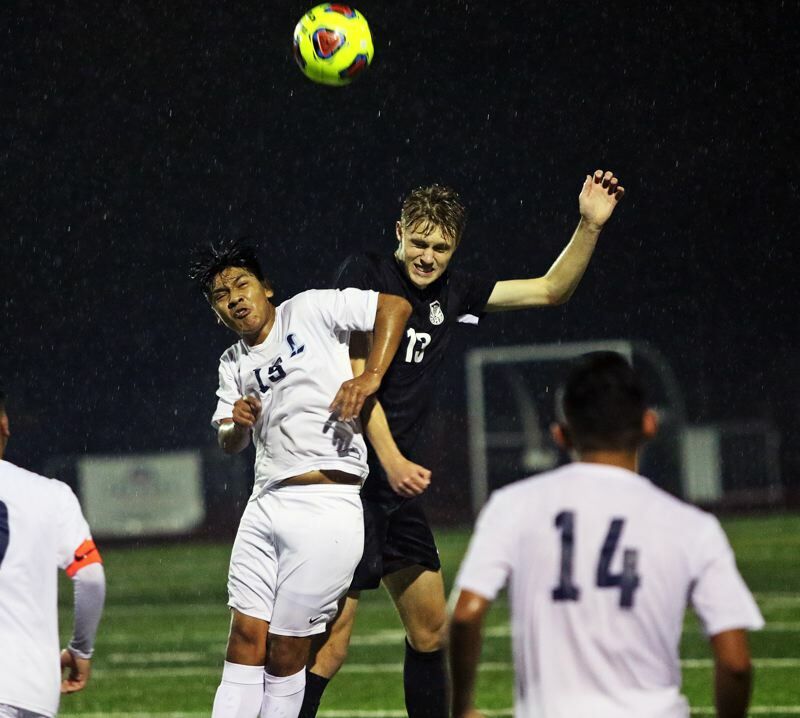 The Timberwolves saw their season come to an end with a 3-2 loss to Liberty in a state playoff first-round match played Saturday under rainy skies at Tualatin High School. Liberty, the No. 4 team out of the Pacific Conference, improved to 9-4-2 on the season with the victory. The Falcons also advanced to play at Summit in a second-round state playoff match on Tuesday. Tualatin, the No. 3 team out of the Three Rivers League, finished its season with a final overall record of 12-3. The Wolves struck first in Saturday's playoff contest. Tualatin senior forward Saul Aparicio scored on a sliding follow-up shot, after senior Mario Quiterio's attempt was blocked, giving the Wolves a 1-0 lead with 23 minutes and 19 seconds left to play in the first half. 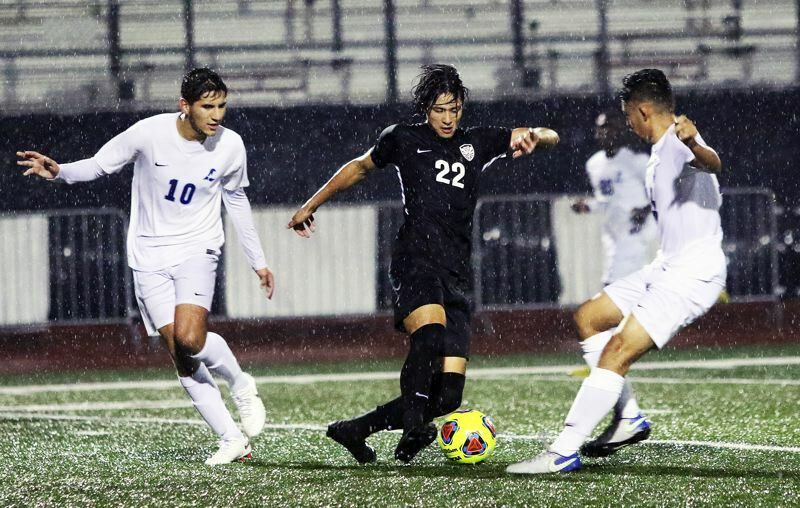 But Liberty struck right back, tying the match at 1-1 less than a minute later, when junior forward Marcos Salinas Orozco scored on a driving shot with 22:25 remaining in the first half. Tualatin would regain the lead, at 2-1, when Quiterio hit a shot from 15 yards away on the left side, with the ball hitting the left post of the Liberty goal and bounding into the back of the net with 19:18 left before halftime. From there, Tualatin sophomore goalkeeper Tyler Goodell punched away a free-kick shot by Liberty senior Eduardo Flores Garcia with 12:05 left in the first half, and Tualatin junior Nathan Buckalew had a free-kick shot from 45 yards out sail over the crossbar of the Falcon goal with 1:45 remaining in the half, leaving the Wolves with a 2-1 lead at the intermission. Liberty came back to tie the match early in the second half, at 2-2, on a goal coming with 37:31 left to play in the contest. Tualatin, trying to regain the lead, got shots on goal from Quiterio and Buckalew, but they were both saved by Liberty senior goalkeeper Evan Kupperman. The Falcons then took their only lead of the match, at 3-2, when sophomore Daniel Soriano's bending shot from 30 yards away slipped inside the right post of the Tualatin goal with 15:43 left to play in the match. Tualatin, trying to battle back, had a shot by senior Daniel Valdovinos with 12:35 remaining tipped over the crossbar by a leaping Kupperman. Then, with just two seconds showing on the clock. Quiterio's attempt from 30 yards out sailed just barely over the crossbar of the Liberty goal, leaving the Falcons with a 3-2 victory. The loss marked the final high school match for Tualatin seniors Cole Carlile, Kyle Ybarra, Santiago De La Torre, Quiterio, Valdovinos, Holden Hauke, Fernando Navarro-Miranda, Thomas Augee, Richy Olguin, Nelson Morales, Zach Wesson, Eddy Figuroa, Aparicio, Owen Peterson, Christian Pumpelly and Yarik Texta.